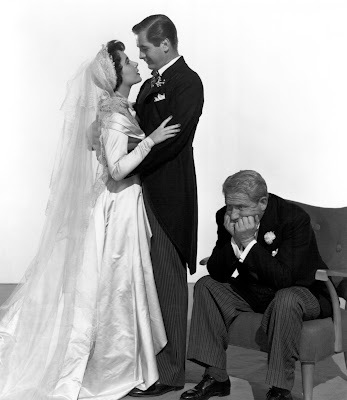 Father of the Bride (1950), starring Elizabeth Taylor, Don Taylor, and Spencer Tracy, is one of the 1001 Classic Movies You Should See. Each Monday, I'm going to recommend a classic movie you should see (for the reasons behind the 1001 series and reviews of earlier films covered go here). June is the traditional month for weddings so throughout the month I'll write about four diverse movies with "bride" in the title. First up is the classic family comedy, Father of the Bride (1950). Father of the Bride tells the story of Stanley Banks (Spencer Tracy), a successful suburban lawyer whose beloved daughter, Kay (Elizabeth Taylor), has just announced her engagement to a pleasant young man (Don Taylor). Stanley's wife (Joan Bennett) is determined to give Kay the best wedding that money can buy, which results in a whirlwind of parties and wedding planning that exasperate the practical Stanley. 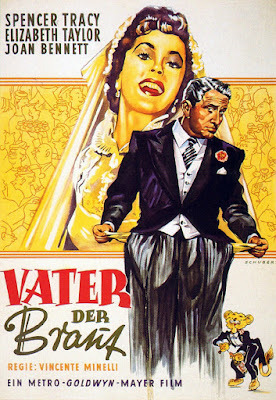 Father of the Bride was based on a best-selling 1948 comic novel by Edward Streeter that MGM bought for director Vincente Minnelli. Although comedian Jack Benny wanted the part of Stanley, Minnelli chose veteran MGM star Tracy, whom he felt was the only actor who could capture both the character's humor and his love for his family. Father of the Bride was released to coincide with Taylor's first marriage to hotel heir Nicky Hilton, and the resulting media frenzy helped the movie become one of MGM's biggest hits of the 1950's. While Father of the Bride has a lot of timeless humor, it's also an interesting portrait of life in the early 1950's. After the hard times of the Great Depression and World War II, Americans were more affluent than ever, and they were willing to spend their hard-earned cash on many things, including lavish weddings. Father of the Bride goes into such detail about Kay's wedding that it almost serves as a guide for moviegoers who wanted to plan their own lavish affairs. Throughout the film, audiences learn how much a wedding cost per person ($3.75 in 1950), how many clothes you need for a trousseau (let's just say a lot), and how to walk down the aisle with the dignity (the time-honored step-stop strategy). 1. Sitcom elements. The episodic nature of Streeter's novel gave MGM screenwriters fits, but it actually makes Father of the Bride seem like the first fifties sitcom with Stanley, his lovely wife, and their three adorable children moving through a series of 20-minute slice-of-life vignettes. 2. Tracy. The actor earned his fourth of nine Academy Award nominations for Father of the Bride, and he richly deserved the honor. The film simply wouldn't work without Tracy who is excellent at portraying both Stanley's tightwad tendencies and his deep love for his beautiful daughter. 3. Helen Rose. The MGM costume designer is best known today for designing Grace Kelly's wedding dress, but she also designed the costumes for this film, including Kay's lovely wedding gown. Rose also designed the gown for Taylor's marriage to Hilton. 4. Leo G. Carroll. The great character actor has a plum part in Father of the Bride as a snooty wedding planner hired by the Banks. One of the highlights of the film happens when Bennett is explaining her plans for the reception, and Carroll fixes her with a cold stare and says, "Madame, that's what we do for children's parties." Other critics: Father of the Bride has a 93 percent fresh rating at Rotten Tomatoes, and Leonard Maltin calls it a "perceptive view of American life" in a four star review for his Classic Movie Guide. Critics in 1950 were mixed about the film's merits. Bosley Crowther of The New York Times gave it an unqualified rave writing that, "'Father of the Bride' is a honey of a picture of American family life. It shouldn't discourage matrimony but—well, this reviewer is certainly happy to have all sons." On the other hand, the Variety critic hated it as he/she noted in an extremely picky review. "Minnelli could have timed many of the scenes so that laughs would not have stepped on dialog tag lines. Also he permits the wedding rehearsal sequence to play too long, lessening the comedic effect." Elizabeth Taylor in the Helen Rose-designed wedding dress for Father of the Bride (1950). The bottom line: Father of the Bride is a timeless family comedy that is as delightful today as when it was released. Watch it for the funny, tender performance of Spencer Tracy. 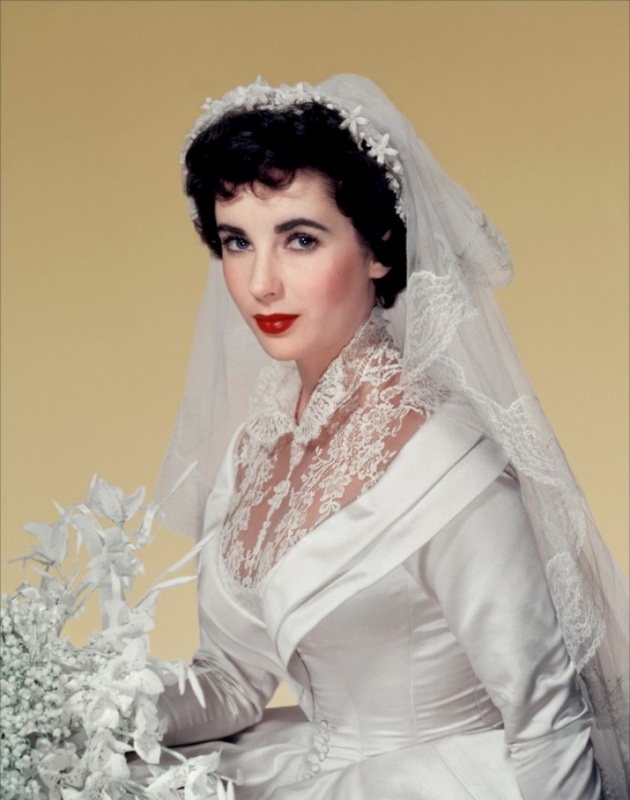 Availability: Father of the Bride will air at 10 p.m. June 19 on TCM. It is also available on DVD, Blu ray, and video on demand. Next Monday, I'll continue the brides theme with a look at the musical, Seven Brides for Seven Brothers (1954). My favorite scene is the how the Father of the Bride gets stuck in the kitchen mixing "Old Fashions". Tracy is really funny in that scene. This is undoubtedly the most special event venue in the city. We had 6 passed appetizers with the Liguria table which consisted of steamed veggies and fruits and breads. I didn't even care that I'd just been to another feast less than 12 hours ago. At wedding venues NYC I could not stop eating.